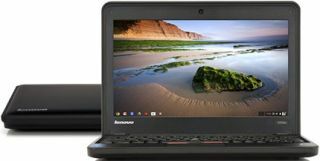 The Chromebook has quickly moved into prominent discussions among educators as a flexible Internet-based device in classrooms. Whether you are using the system as a cart or taking advantage of 10-second start-up times or optimizing it as a low-cost 1:1 device for utilizing Google Apps, the Chromebook is now a computer that schools must consider. Over the past year, several manufacturers have come into the marketplace, including Samsung, Acer, Lenovo, and HP. Since Chromebook’s operating system is the same across all of these platforms, we thought it would be interesting to take each model for a test drive and look at what makes them unique. Today we look at the Lenovo x131e Chromebook. Next up - the HP 14-c010us. The Lenovo x131e Chromebook is durable and offers good battery life. However, the trackpad size is really too small for any of the gestures, although it tries to make up for this with the three button mouse and traditional Lenovo "eraser tip" mouse. It looks and feels like a brick, e.g., built strong, but not attractive. Size: 11.55" x 8.50" x 1.27"
Keyboard: Includes keys with rounded bottoms for extra room. All letters are in Caps Lock position. Inverts function and ctrl key. Durability:Very strong. Screen is encased in durable strrong plastic and is set back from the edge with a thick bevel. Traditional power cord 1/4" diameter.